Love Bernie. Hate Bernie. Frankly, my dear, I don’t give a damn. I’m violently non-partisan by profession and nature. But, I demand you read Ted Rall’s comic book biography of Bernie Sanders. Rall’s Sanders was not the intellectual child of Karl Marx. Rather, he was the child of Eli Sanders, a low-ticket salesman whose commissions barely covered the rent on a one-bedroom flat in Brooklyn ”“ except when they didn’t cover it and Sanders’ parents would fight. 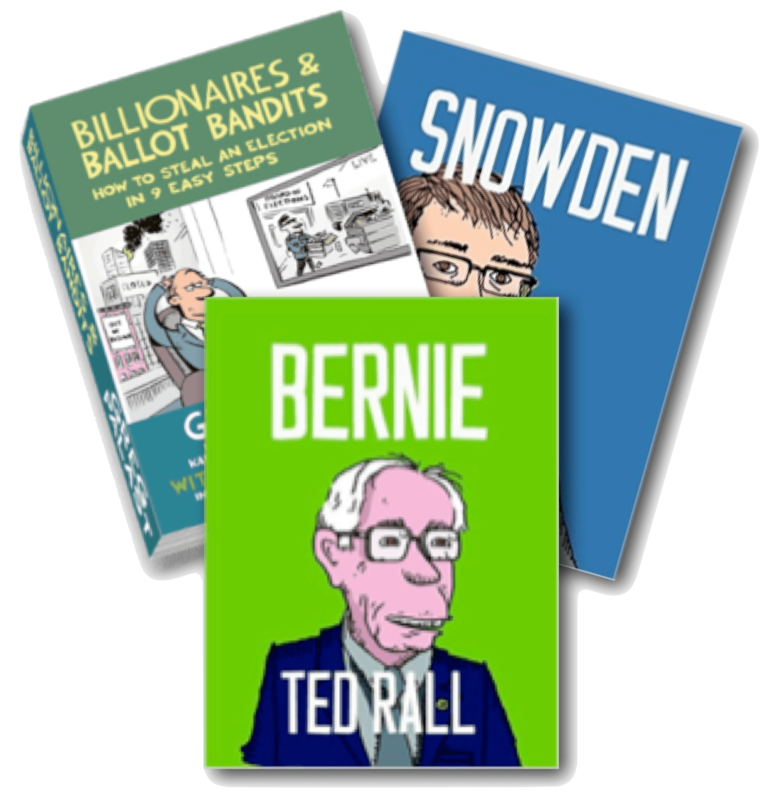 Get a signed copy of Ted Rall’s Bernie, the brilliant 200 page full-color comic-book biography by making a tax-deductible donation of $65 or more to the Palast Investigative Fund. Or order Bernie on Amazon, Barnes & Noble or Indiebound. Rall, a Journalism Fellow of The Palast Investigative Fund, is also the penman-author of Snowden, and, with Greg Palast, the New York Times bestseller Billionaires & Ballot Bandits. For a tax-deductible donation of $150 you can get the signed Palast & Rall Book Trio. Ted Rall is an ornery cuss, so he has lots of gripes about some of Sen. Sanders’ votes and views ”“ and the book is the better for it. The book’s opening is a particularly enjoyable I-didn’t-know-that history of the Democratic Party’s “moonwalk,” sliding right while pretending to defend progressive views. It’s the betrayal that created Bernie’s movement, not just his political moment. With Bernie, Rall does the job that used to belong to news reporters ”“ illuminate the soul of a candidate. And, most importantly, he puts Progressivism back into the story of American history. Given that our media covers little more than pollster yammering and Trump’s hairdo versus Hillary’s, Rall’s book comes as a welcome cure for stupid. I am turning The Best Democracy Money Can Buy into a feature length film about the billionaires and ballot bandits and their plans to steal the 2016 election. Watch the Trailer. Be our mogul angel. Donate at least $1,000 to the Palast Investigative Fund and you’ll get a Producer credit and tickets to our Hollywood opening. Or donate $500 for a Co-Producer credit. You can save America while getting a tax deduction. Or support our work by making a tax-deductible No Gift donation. No matter how small or ginormous, it’s all immensely appreciated! The filming is nearly complete ”“ but editing the good stuff from the secret camera hidden in my hat (no kidding)””and adding the way-cool graphics to illuminate those confidential documents that you’re not supposed to see””that takes some cash. So I’m asking you for your direct support so we can get this exposÃ© on the air in 2016””and bust the vote thieves before they commit the crime.